Was Russia Probing U.S. Electoral Systems? Maybe, but gathering intelligence is not the same as full interference. The most recent Russiagate expose comes from The Intercept, which was founded by Glenn Greenwald and Jeremy Scahill. The site has been the source of a number of stories that rely on stolen or leaked government documents, including material from Edward Snowden. It has also produced some exemplary investigative reporting on U.S. government high crimes and misdemeanors of various kinds, including its account of the Obama Administration assassination program and, more recently, the misrepresentation by the White House of the military action in Yemen that killed an American Navy Seal. 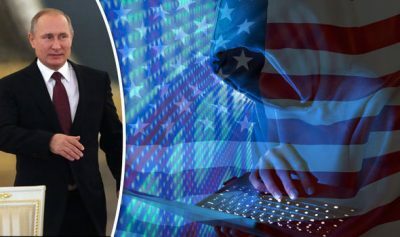 The article appeared yesterday and is entitled “Top-Secret NSA Report Details Russian Hacking Effort Days Before the 2016 Election.” The report mentioned is dated May 5. The leaker, an NSA contractor named Reality Leigh Winner, working out of Georgia, came to the attention of the authorities after The Intercept contacted the NSA and asked for comments before it ran the article. It was asked not to run the piece, but was willing to redact some material at the request of the government. Winner was identified by microdot keys on the paper that led to the copier she had used. She has been arrested and charged under the Espionage Act and is the first Trump-era leaker to be prosecuted. The article has inevitably caused quite a stir among those like myself, who believe passionately that Russiagate is mostly a politically-motivated fraud, and those on the other side of the fence, who think that Moscow did interfere in the recent presidential election with the intention of helping Donald Trump win. The report described two cyberattacks that its NSA authors attribute to Russia’s military intelligence unit, the GRU. The first attack “evidently to obtain information on elections-related software and hardware solutions” was on August 24, 2016, directed against a company that markets voter registration software. The second occurred about a week before the election, directed against 122 local election officials, presumably in the eight states where the company operated. The attacks employed spear phishing, which is using spoof emails to deceive users into accessing links or attachments that install malware on the computer of the user. The spoof emails were reportedly sent from two email providers, Google’s Gmail and Microsoft’s Outlook.com, so they would look benign to a United States user. VR Systems’ products are used by electoral commissions in California, Florida, Illinois, Indiana, New York, North Carolina, Virginia, and West Virginia. 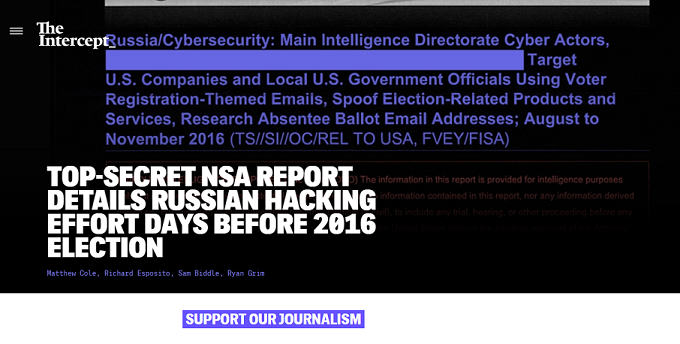 In its article, The Intercept opines that “the report indicates that Russian hacking may have penetrated further into U.S. voting systems than was previously understood.” If everything related in the report is true, indeed it does, and it somewhat challenges Russian President Vladimir Putin’s recent emphatic claim that his country had not interfered in the U.S. election. And I would also make some additional observations about what the report and Intercept article are suggesting. First and foremost would be the questions of scale and timing. There is no evidence that the Russians, or whoever carried out the probes, were able to tamper with either the actual voting process or the tabulation of votes. Indeed, the NSA report dismisses any such possibility. Second, corrupting an election in a country as large as the United States with an electoral system that is largely decentralized would require much more than a probe of 122 local officials starting a week before the balloting. So there was clearly no intention to disrupt the election or to tilt it in a certain direction based on the evidence provided by the NSA report. I would also note that there is no proof provided in the report to support the assertion that the GRU, Russian military-intelligence service, carried out the probes. Would a highly-sophisticated intelligence service behave so transparently in an operation that would certainly be regarded as highly sensitive? I think not. Cut-outs would have been used to misdirect anyone looking to determine the hand behind the hacks. All of which is not to say the Russian government didn’t do it or order it done, but it seems to me that the revelations provided in the NSA report do not go very far beyond the kind of random probings that are part and parcel of foreign-intelligence operations as carried out by any sophisticated service. Did someone in Moscow think it might be useful to have some kind of idea of how to meddle with U.S. election technology if that type of info might prove useful down the road? Quite possibly. It should be noted that the U.S. National Security Agency illegally collects vast quantities of information on ordinary Americans but that does not necessarily imply intent to use it in a malicious way. It is a desirable capability and intelligence agencies are always working to expand their reach. So was Russian intelligence probing U.S. electoral systems? Quite plausibly yes, and it should be a matter of concern for every American as it suggests a vulnerability in the electronics behind how we vote. But did Russia actually interfere with the election or seek to use the probing to elect a particular candidate? The answer is clearly no. The article and the document it is based on should serve as a wake-up call to those who are complacent about the security of our technologies. But on a political level, we are back to square one, with often hysterical allegations surfaced as part of the media and political storm we now refer to as Russiagate.